Constructed from FRP and weighing in at 30lbs per seat. 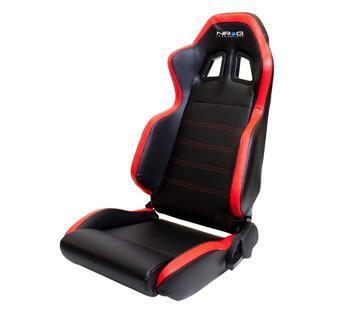 Our all new recline-able bucket seat offers comfort and function for your daily driver. Being a bucket type seat it also has great support for the weekend track warrior or canyon carver. The red stitching adds a nice touch of style to the durable cloth seat, which is offered in a flat black or metallic silver backing. Each seat comes equipped with sliders and all you will need for the install is seat brackets specific to your vehicle. Although the seats are compatible with factory seat belts, a NRG Harness bar and safety belt harnesses are highly recommended.